Expectedly, tension has begun to mount ahead of the commencement of legislative business of the Ninth Assembly. Like in 2015, the ruling party with the majority in both chambers has started to bare its fangs telling whoever cares to listen that it would not give the minority party any chance in the destiny of the parliament in the next four years. National Chairman of the All Progressives Congress, Comrade Adams Oshiomhole, and other critical stakeholders in the All Progressives Congress (APC) have begun to stoke the fire of avoidable controversies that portend danger for the serenity of the parliament even while still in its embryonic stage. The APC boss in his recent comments has said that the control and leadership of the National Assembly would be the exclusive of his party members. He even added that opposition lawmakers would never be appointed to head strategic or ‘juicy’ committees in the parliament. Though the APC National Chairman is stamping his authority, the onus of choosing the leadership of the Ninth Assembly rests solely on the elected members. This is notwithstanding the insinuation that the lawmakers may only be made to affirm their leadership. While some political observers argue that it is healthy for the ruling party and even the executive to have input into who leads the legislature, many others believe that such should be done covertly without seeking to impose principal officers on the parliament. The frosty relationship between the leadership of the Eighth Assembly and the President must have prompted the determination of APC’s leadership to take charge early and ensure that trusted party members are elected into pivotal positions in the National Assembly. It is on record that the working relationship between President Muhammadu Buhari and the current Senate President Bukola Saraki led National Assembly is anything but cordial. The President recently lamented that his administration’s performance was slowed down by the parliament which could not pass budgets at the regulated time. Obviously, the President would not repeat the mistakes of the past where he allowed the parliament to choose leaders who ended up being overtly independent and refused to work at the same wave-length with his government. So the party insistence on nominating the leadership of the Ninth Assembly is understandable. But the President and the APC leadership must be careful in this venture so as not to injure the basic tenets of democracy. Principles of separation of powers and checks and balances in a growing democracy must not be decountenanced. Having a rubber stamp parliament where proposals from the executive would not be subjected to robust debates can be counter-productive. There are no developments at the state levels because governors are emperors and oracles not to be queried by their lawmakers. Enthroning pliant leadership that would turn blind eye to executive excesses in a heterogenous society like Nigeria is an endorsement of tyranny and this is dangerous. While one may not grudge the APC National Chairman for advocating a winner-takes-all politics in the National Assembly when he ordered that no juicy committee should be allocated to any opposition lawmaker, he should be advised to employ decorum by putting national interest ahead of party supremacy. It is a known fact that ranking plays great roles in determining appointments of individual lawmakers to committees. Experience and professional qualifications are equally important. So these must not be jettisoned on the platform of party supremacy. Oshiomhole should be reminded that even though parliamentarians got elected on the platform of their parties, national interest takes a pride of place in legislative business. Now that they have been elected, political platforms matter less. He should also know that the parliament can not be run by decrees as those elected members are cerebral citizens with minds of their own. Many of them are past governors and top rated bureaucrats who can hold their own anywhere they find themselves in the world. He must therefore learn how to build consensus through internationally acknowledged method of lobbying. The leadership of the ruling party must not assume the role of meddlesome interlopers as the lawmakers have the exclusive right to determine whoever emerges their leaders. Urging the new leadership of the parliament not to consider members of the opposition for juicy slots is tantamount to sowing seeds of discord in the legislature. Building a prosperous country for the benefit of all requires collective efforts more so when the ultimate reason for their election is service to the people. The APC leadership must also consider the stability of the parliament even as it strives to assert control of the National Assembly. Whoever it plans to impose on the members must first be accepted by the majority of the members. Where the leadership is not acceptable to majority of the members, the proverbial banana peel which saw to the instability of the parliament under former President Olusegun Obasanjo may have been activated. 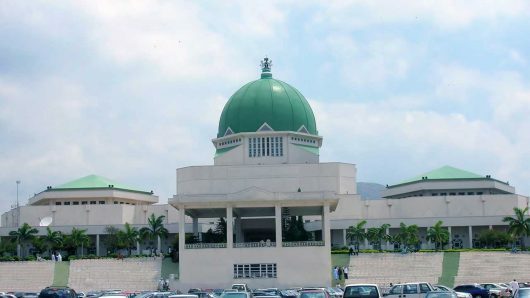 Members of the National Assembly resent imposition and where they become disgruntled owing to the imposition of an unpopular leadership, chaos becomes inevitable like it was between 1999-2003 where Senate Presidency was being changed like a woman would her baby’s diapers. As things stand now, it is common knowledge that the party leadership is routing for Senator Ahmed Lawan as the incoming Senate President while it is also pushing for the emergence of Rt. Hon. Femi Gbajabiamila as the Speaker of the House of Representatives. Others are also gearing up to contest the positions both at the Upper and Lower Chambers. What is expected of the President and the party leadership now is to put in place a machinery for consensus building. Those aspiring to positions but could not be accommodated by the proposed structures by the party should be pacified. Frayed nerves should be calmed. The party’s National Chairman’s words should be less combative and confrontational. This is because whoever emerges as the leader of the parliament would need the ultimate cooperation of his/her colleagues to succeed. Though the APC has the majority in both chambers, the opposition elements should not be treated with disdain because they would be needed sometimes when critical decisions are to be taken. To this extent, cross party lobby is necessary. Therefore, the APC’s position of winner-takes-all should be vigorously interrogated for the Ninth Assembly to be peaceful and successful.